Heparin is one of the most intensively studied glycosaminoglycans as a result of its anticoagulant properties. Heparin is used as an anticoagulant either in its native unfractionated form (UFH) M.W. ~ 16 kDa or as partially depolymerized form called low molecular weight (LMW) heparin M.W. ~ 4-8 kDa. Biomat developed three Heparin Catcher plates HC1-HC2-HC3, as special surfaces onto which heparin at different ranges of U/ml can be immobilized. 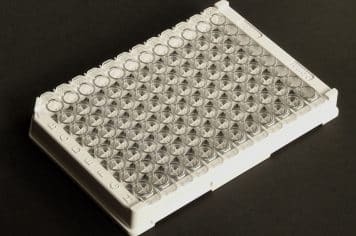 The proposed assays exploit the different Biomat heparin catcher plates, by quantitative enzyme-linked assays for the in vitro measurement of unfractionated heparin in low protein content fluid such as a buffer. These heparin ELISA tests are competitive assays in which the colorimetric signal is inversely proportional to the amount of heparin present in the sample. Samples to be assayed are at first mixed with a known amount of biotinylated heparin within the wells of Biomat heparin catcher plate. The Heparin in the sample competes with biotinylated heparin to bind to the binding sites of heparin catcher plate. After the removal of the unbound reagent and sample, a streptavidin-peroxidase conjugate is added to reveal the reaction. The concentration in the sample is determined using a standard curve of known amounts of heparin. HC1 (range 0.01 – 2.0 U/ml) and HC2 (range 0.5 – 40.0 U/ml) are coated using 100 µl/well. HC3 (range 2.0 – 160.0 U/ml) is coated using 200 µl/well. The strips are post-coated (blocked) for low non specific binding and long-term stability. 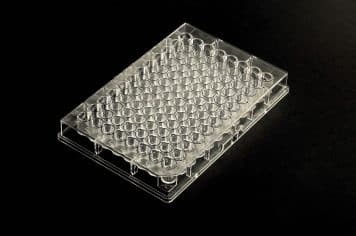 Microplates show a CV% less than 5 when are used as a catcher of heparin-biotin in an ELISA format, using Streptavidin-HRP as detector and TMB as substrate.